Science Fiction, Fantasy, Horror and more. Featured Book or Magazine of the Week. Story Recommendations. Battle of the Books. Completing our tribute to the late Kurt Vonnegut, the Book of the Week is More Than Human by science fiction great Theodore Sturgeon. Kurt Vonnegut publicly stated that Theodore Sturgeon was the inspiration for his fictional sci-fi author Kilgore Trout -- although really, aside from having the name of a fish, Kilgore Trout bears far less resemblance to Sturgeon than to Vonnegut himself. This is the first paperback printing of More Than Human, published in 1953, simultaneously with the extremely rare hardcover first edition. The cover is by famed SF artist Richard Powers. Theodore Sturgeon was one of the leading SF authors from the 1940's through the 70's, although for whatever reason he never caught the attention of the general public as Kurt Vonnegut did. In addition to his fiction, Sturgeon is widely remembered in the genre for announcing the principle that came to be known as Sturgeon's Law: "90% of all science fiction is crap. But then, 90% of everything is crap." More Than Human, about a small group of misfits who prove to represent the next step in human evolution, is widely regarded as Sturgeon's best novel. Next week's Book of the Week will be my personal favorite Sturgeon novel. Following up on our tribute to Kurt Vonnegut, the Book of the Week is Venus on the Half-Shell by Kilgore Trout, published in 1975, with cover art by Victor Gadino. Kilgore Trout was an invention of Kurt Vonnegut, a make-believe science fiction writer who appeared in many of Vonnegut's novels. According to Vonnegut, Trout was underappreciated as an author, largely because he was mistaken for a sleaze writer after some of his early works were published by pornographers. Trout was supposedly the author of over 100 novels, but Venus on the Half-Shell is the only one ever to see print in the real world, thanks to another science fiction author, Philip Jose Farmer. Philip Jose Farmer is one of my personal favorite authors (you will see more of him in future BOTWs). Even though he has enjoyed significant success in the science fiction field, many of us believe he remains underappreciated, perhaps in part because he was mistaken for a sleaze writer after several of his early works were printed by pornographic publisher Essex House. Farmer delighted in borrowing other authors' fictional creations, and wrote Venus on the Half-Shell as a tribute to Vonnegut. In Venus on the Half-Shell, Farmer deliberately imitated the style of Vonnegut, successfully enough that when the book came out several reviewers insisted that it really was by Vonnegut, even though he denied it. The Washington Post review declared, "Trout's prose is at least as good as Vonnegut's," then ended the review with the words, "Thanks, Kurt." The confusion annoyed Vonnegut enough that he later had some snappish things to say about Farmer free-loading off his reputation. This was rather unfair, since Vonnegut gave Farmer permission in advance to create Venus on the Half-Shell and declined Farmer's offer to share the royalties. While Kilgore Trout evolved into a semiautobiographical figure in Vonnegut's writings, he was originally inspired by yet another science fiction writer, the subject of next week's BOTW. Aaron's Book of the Week :: Utopia 14 by Kurt Vonnegut, Jr. 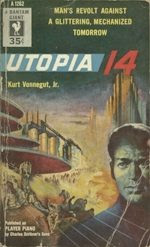 Continuing our tribute to the late Kurt Vonnegut, Jr., the Book of the Week is the first paperback printing of Utopia 14, Kurt Vonnegut's first published novel, set in a mechanized future society. All you Vonnegut fans out there racking your brains trying to remember a book called Utopia 14 can relax -- the book is far better known under the title Player Piano. Subsequent editions have always used the Player Piano title, no doubt because mainstream readers would be scared off by the sci-fi sound of Utopia 14. (I'm not quite sure why Vonnegut's second book, The Sirens of Titan, never received the same kind of name change. Perhaps publishers were counting on mainstream readers being unaware that Titan is the largest moon of Saturn.) Of course, the fact that the mainstream eventually did acknowledge Vonnegut as an outstanding writer, and then tried to redefine his work as not science fiction at all, is only further evidence of the absurdity of the prevalent prejudice against SF. A final link between Vonnegut and the SF field is his recurring character Kilgore Trout. Kilgore Trout was inspired by one of Vonnegut's fellow SF writers. Before we get around to revealing who that was, next week's Book of the Week will be the only book ever published as by Kilgore Trout. The book was not written by Kurt Vonnegut as widely suspected, but by another prominent SF author. Aaron's Book of the Week :: Cat's Cradle by Kurt Vonnegut, Jr. The Book of the Week is the first paperback printing of Cat's Cradle (1963) by Kurt Vonnegut, Jr. This is to honor Vonnegut, who passed away in April at the age of 84. Kurt Vonnegut was celebrated for his distinctive writing style, which blended science fiction tropes with satire and black humor. His work undoubtedly influenced later science fiction satirists such as John Sladek and James Morrow. Vonnegut resisted classification as a science fiction writer, not because he denied that his work was science fiction -- most of his books are SF by any conceivable definition -- but because he wished to avoid the mainstream's demeaning attitudes toward SF. In 1965 he wrote, "I have been a sore-headed occupant of a file-drawer labeled 'science fiction' ever since [Player Piano], and I would like out, particularly since so many serious critics regularly mistake the drawer for a tall white fixture in a comfort station. The way a person gets into this drawer, apparently, is to notice technology. The feeling persists that no one can simultaneously be a respectable writer and understand how a refrigerator works." While Vonnegut sold some of his earliest stories to Collier's magazine, much of his early work first appeared in genre SF publications such as Galaxy and If magazines and Again, Dangerous Visions. His famous story "Harrison Bergeron" was first published by Fantasy & Science Fiction magazine. Next week's Book of the Week, the first paperback edition of Vonnegut's first book, leaves no doubt that Vonnegut was marketed as a science fiction writer early in his career, before being "discovered" by the mainstream. We are readers, reviewers, and collectors of science fiction, fantasy, and horror books and magazines. Aaron Hughes (Battle of the Books, Book/Magazine/Story of the Week). Aaron also writes fiction under his full name, Van Aaron Hughes. Amy Peterson (webmaster, tweets about our blog on Twitter, Battle of the Books, and other miscellaneous stuff).